Amazon.com (NASDAQ:AMZN) intends to leverage Whole Foods Market to drive new growth in its Prime member loyalty program. Believing it has blunted its “Whole Paycheck” image, the organic grocer will be expanding into the suburbs with more stores offering Prime Now delivery. Because the grocery wars are intensifying, with more rivals cutting prices, Amazon is consolidating its grocery message around the formats where it thinks it can win. Previously, Amazon offered several ways for the grocery store shopper to buy from it. The company delivered nonperishable food items and household supplies through its Prime Pantry service. It also delivered fresh groceries through AmazonFresh. It also operated Whole Foods Market grocery stores, Whole Foods 365 discount stores, Amazon Go convenience stores, and Whole Foods grocery delivery through Instacart and Prime Now. In the past month, however, Amazon ended its relationship with Instacart and announced the Whole Foods 365 chain won’t expand to new markets as previously planned. The signs are there that we will see more changes in the near future. Aldi is spending over $5 billion to remodel its existing 1,800-store chain and open 800 new ones to become the third-largest grocer behind Walmart and Kroger. Lidl, whose prices tend to be even lower than Aldi’s, is also expanding, though primarily on the East Coast and not at the same rate as Aldi. Weis Markets, a mid-Atlantic chain, announced price cuts on some 7,000 products. Kroger previously said it was cutting prices in its Roundy’s chain to compete with Amazon and Aldi. The pioneer of online grocery stores, Peapod, cut prices on thousands of products last year. Walmart — which offers delivery from more than 800 of its stores and plans to add 800 more in 2019 — added four more companies to expand its online grocery-delivery options. This comes as Amazon is feeling the effects of slowing online grocery sales, with growth tumbling 25% in 2018 from the prior year. According to an analysis by ecommerce consultant group Edge by Ascential, “After spending years investing in subpar programs like Amazon Fresh and Prime Pantry, consumers still aren’t sold on buying fresh food online.” The analysis suggested this was a major reason Amazon bought Whole Foods in 2017. Prime growth has also stagnated in the U.S., which would explain why Amazon now wants to expand its grocery delivery options into the suburbs and give more rural customers a chance to take advantage of two-hour delivery through Prime Now. Amazon continues to increase its benefits offerings to Prime subscribers. 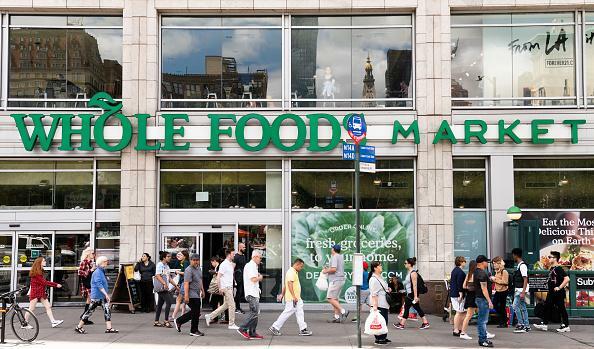 Adding the ability to shop at Whole Foods for people living where the chain is currently unavailable might be a way to boost Prime membership. And because Whole Foods has had a reputation in the past for being associated with more affluent communities in larger metro areas, expanding to more rural markets could be considered a big change in direction for the grocer. Even so, questions linger about whether Whole Foods has really broken with its upscale image. Surveys show sizable chunks of the public still believe its prices are too high. A Yahoo! Finance survey last August found 40% of the 2,000 people polled believe Whole Foods prices have not noticeably fallen. Because Prime Now is only available in some 60 U.S. cities, the expansion of Whole Foods into more markets (and the grocery delivery service that would come with it) might herald an accelerated expansion of grocery delivery to underserved regions of the U.S. It could also indicate Amazon.com’ser flagging grocery delivery options may be in line for a major shake-up that includes some consolidation.